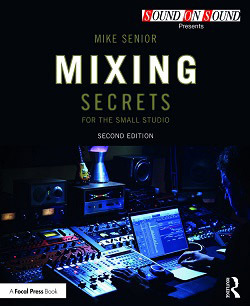 Click here to visit the 'Mixing Secrets' Free Multitrack Download Library! It was getting so big that I decided to move it to its own dedicated page. Internal Rebalancing Of Mixed Stereo Files: One of the most difficult balancing tasks is trying to adjust the levels of different instruments within a mixed stereo file, a situation most commonly encountered when you're mixing music built around samples from other records. Here's an example of this kind of processing in practice, the aim being to increase the vocal level as much as possible relative to the other instruments in this mixed stereo sample (Ex15.01:WAV/MP3 ). Chopping out an earlier isolated example of the song's triggered kick-drum and phase-cancelling it with that in the sample helps reduce the kick's level (Ex15.02:WAV/MP3 ) and high-pass filtering removes a lot of other unwanted low-end below the vocal register (Ex15.03:WAV/MP3 ). Some precise fader automation ducks the snare hits to an extent (Ex15.04:WAV/MP3 ) and some more targeted ducking of the stereo Sides component takes that a little further (Ex15.05:WAV/MP3 ). Some fast high-frequency limiting dulls both the hi-hat and the snare (Ex15.06:WAV/MP3 ), while a couple of automated low mid-range notch EQ bands further target the body of the snare sound (Ex15.07:WAV/MP3 ). The main remaining balance problem now stems from the rhythm guitar, and that's tackled using a set of five level-automated comb-filters (with root frequencies at 262Hz, 292Hz, 331Hz, 352Hz, and 441Hz) to individually target each of the part's main pitched notes (Ex15.08:WAV/MP3 ). Now, compare this result with the original untreated sample (Ex15.01:WAV/MP3 ) -- the processing has made a big alteration in the balance, although not without some trade-offs for the vocal tone itself. Experimenter's Bias & ABX Testing: In the book I talk about a lot of different ways that your mixing decisions can be biased, but there's one more that's worth knowing about in some situations: the so-called 'experimenter's bias', namely that when we're presented with a decision, we all naturally tend to prefer the outcome we're expecting. The classic studio example of this is where you merrily tweak a channel plug-in for a few minutes, convinced that you're making things sound better, only to discover that the processor has been in bypass mode the whole time. (Every engineer I've spoken to has had this kind of experience at least once!) This bias is most likely to cause problems where you're trying to evaluate subtle changes. If you're concerned that it's affecting your objectivity, then the best way to deal with it is via ABX (or double-blind) testing. You can find a full explanation of ABX testing, as well as links to software ABX testing utilities, at the PC ABX website. I use KikeG's WinABX software myself.